In this video and the following transcript, I share some thoughts. Legalism from Randy Alcorn - EPM on Vimeo. When it comes to God’s laws in Scripture, a lot of people wonder about legalism. How can you hold to the truth and still have a spirit of grace? How can you hold to truth and not be a law-keeping Pharisee? 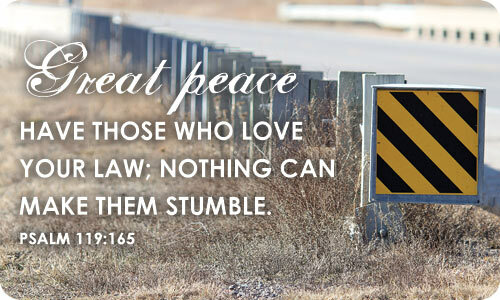 One of the things we have to remember is why God gave us His law in the first place. I’ve used the analogy in my book The Purity Principle about driving along a mountain pass when it’s dark and foggy, and your car runs off the road and you hit the guardrail. You slam on the breaks and get out of the car with a flashlight. What do you do? Do you look at the fender of your car and say, “Oh no. That rotten guardrail! Why did somebody put that guardrail there? Now I’ve got a dented fender!”? No, you thank God for that guardrail. It’s there for your benefit. That guardrail saved your life! One of the things we have to remember is that God gives us His truth not just to impose His arbitrary standards on us. They are not arbitrary; they’re based on His character and given to us out of His love for us. When we are living according to God’s truth, it is not so that we can say, “I’ve been obedient. Look at me, I’ve been a good boy or a good girl.” Yes, we can and should live to please God, but we can also honor the fact that He has given us His truths and commandments out of love for us. I think we need to look at God’s truth and His requirements and commandments in a different way—not as heavy, burdensome things, but rather as things He created us to do to bring honor to Him. Ultimately they’re not only for His glory, they’re also for our good. When it comes to spiritual disciplines, some people think being committed to them is a matter of legalism. I used the phrase “technological Corinth” in 1985 when I published my first book, Christians in the Wake of the Sexual Revolution. Corinth was the immoral city in the first century, and 1 and 2 Corinthians refer to all the immorality in the church’s midst.